"I have always been good at sauteeing asparagus, but this is one of my favorite methods to create a sweet and traditional appetizer." Melt 2 tablespoons butter in a skillet over medium-low heat. 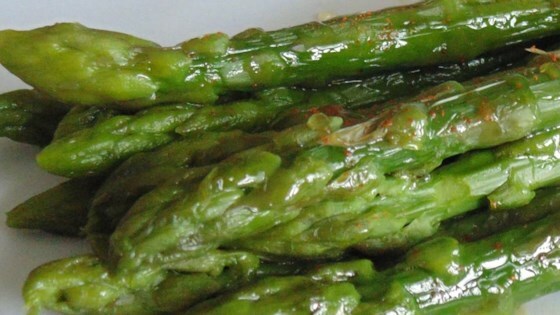 Cook asparagus in melted butter, stirring a few times, until tender, 6 to 8 minutes. Drizzle honey over the asparagus and stir to coat; season with garlic powder and cayenne pepper. Make the perfect spring side dish with grilled asparagus. If you find the asparagus sticks to the pan, you can add up to 1 tablespoon butter more while cooking. For a healthier alternative, use 2 tablespoons of extra-virgin olive oil instead of butter. I really enjoyed this! I actually added some already cooked chicken strips and a handful of frozen bell peppers to it to make it a meal! Excellent! Excellent flavor! The sweet and spicy work perfectly together. Plus this was so quick and easy. Even my 3 year old who refuses any veggies ate this! My family loved this. My teenage son even came back for seconds! Made this following directions. Best asparagus I've ever made. No leftovers. Will make many more times in the future.